Crushing on blush? 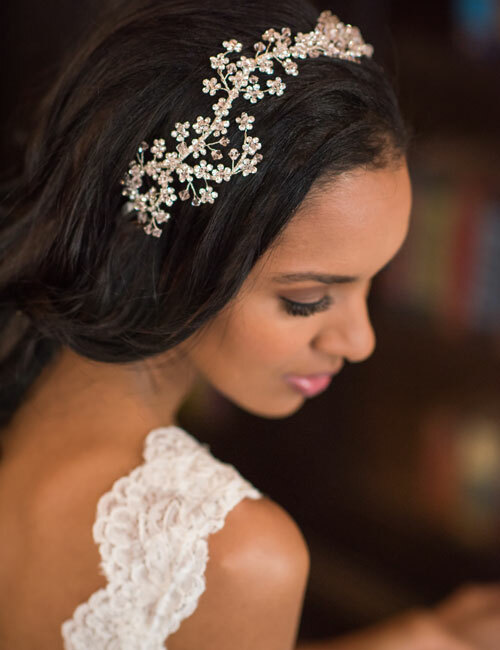 There’s nothing more romantic than whimsical, sparkling accessories to complete a dreamy wedding day outfit! 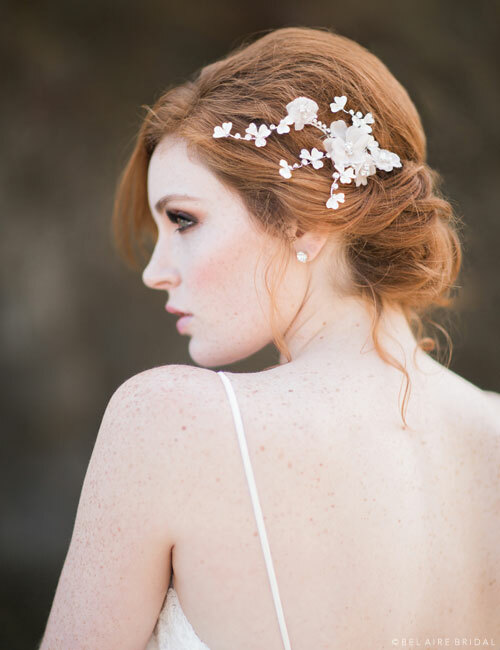 We’ve rounded up some of our favorite headpieces in soft blush and rose gold. Whether you’re crowning a princess-worthy ball gown or adding a bohemian hair flower to your tresses, we hope you delight in these lovely adornments. Soft pink flowers are an obvious choice to pair with a pretty blush gown. Style this branching, delicate comb of organza petals and shimmering rhinestone accents with a lovely veil or glittering jewelry—or nothing at all! This boho-friendly design lends organic beauty to your look. Flowers not your thing? Slip on a glittering, gorgeous rose gold halo! Stunning metallic filigree bejeweled with rhinestones creates a modern yet vintage-inspired headpiece that beautifully dresses your tresses for the big day. Wear it by itself as a romantic statement item, or add a veil for an extra-dreamy look. 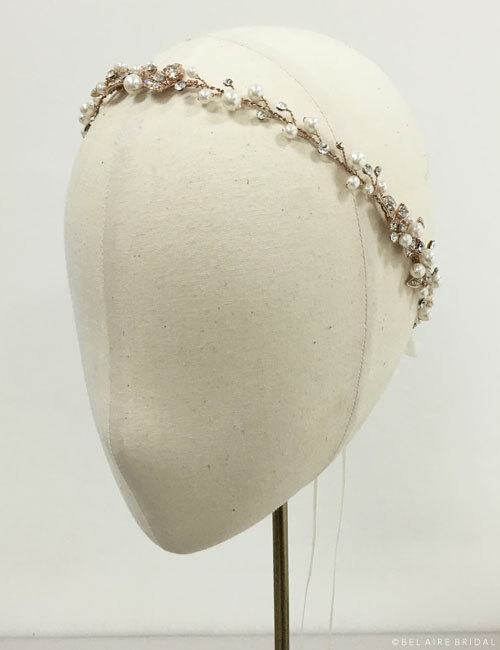 Glitter like dew-kissed flowers on a spring morning wearing this gorgeous crystal headpiece. An array of delicately wired, tiny metallic blossoms glistens with clear or champagne crystals. This nature-inspired headband beautifully complements everything from formal lace gowns to ethereal boho dresses. For the head-over-heels romantic, a floral comb is essential. 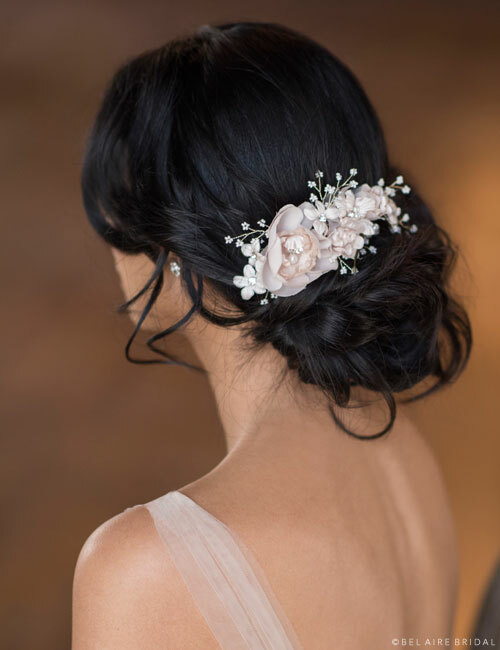 Beautifully accent a chignon or half updo with soft petals, beaded sprays and lustrous pearl accents. This lovely comb pairs perfectly with an elegant veil for the ceremony and may be worn alone for a sweet reception look. What do you get when you combine the classic elegance of pearls with gorgeous rose gold flowers and shimmering rhinestones? Absolute perfection! 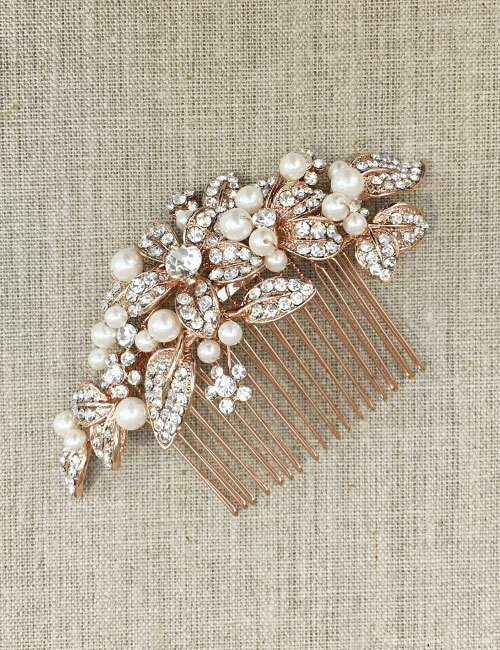 This easy-to-wear comb slips into any hairstyle with stunning bridal beauty. Add romantic earrings, a pretty little veil, and you’re good to go! Add a bohemian twist to your outfit with a luxurious rose gold hair vine! This stunning, flexible design may be tied on as a headband or woven through your locks, as you wish. 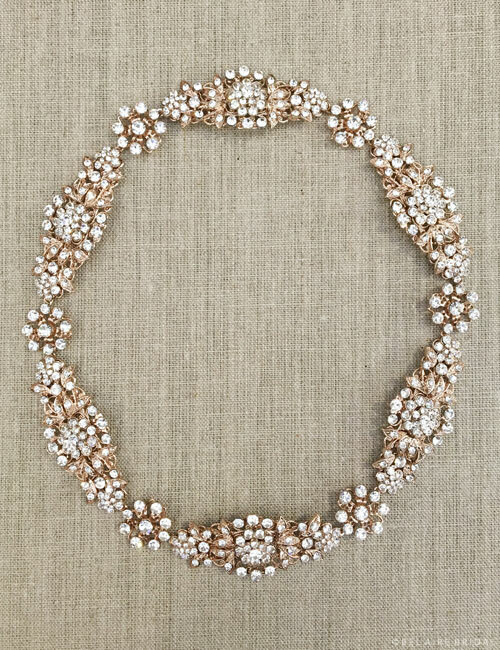 Pair this pearl and rhinestone accent piece with a dreamy veil for exquisite bridal beauty. Crown a gorgeous, feminine bridal ensemble with a rose gold tiara. Crafted in a modern, contoured shape with shimmering rhinestones, this lovely accessory adds instant charm. 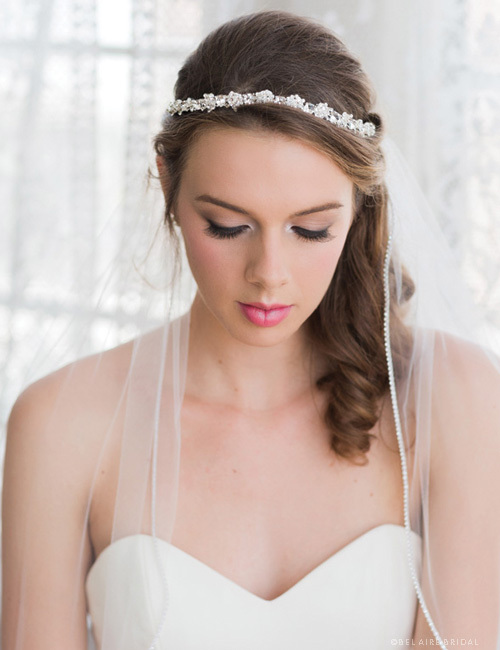 Add a formal veil and stunning jewelry to complete your fairy tale, and make it your best day ever! Want to see more? 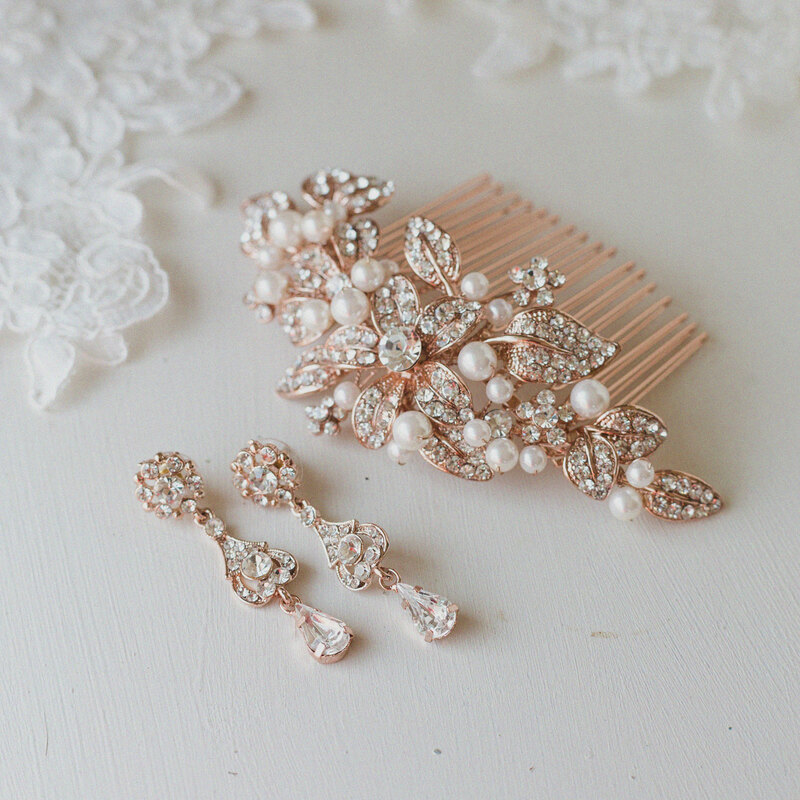 Check out our Rose Gold and My Bridal Style: Romantic pages for inspiration!